Hiking with children is a great way to get them into the outdoors and introduce them to nature, but it can be a bit of a challenge. Small legs seem to tire out faster than larger ones, and when they outgrow both the stroller and the backpack it's best to seek out some shorter hikes with few hills or elevation changes that the whole family can enjoy with a minumum of complaining. One of our favorite easy family hikes can be found at Rush Creek Open Space Preserve, on the northern end of Novato. This 552-acre preserve features wide and gentle trails that are perfect for families. They're easily manageable with an off-road capable jogging stroller, and kids' bikes should be able to tackle the fire roads with ease. You'll share the trails with plenty of hikers, mountain bikers, and horseback riders, as well as birders checking out the countless shorebirds and waterfowl that make their homes in the adjacent wetlands. The main fire roads and multi-use trails skirt the wetlands and offer great views as well as plenty of shade. You can also head off into the hills onto the Bahia Ridge Trail. Either way, you can tailor your hike to the abilities of the hikers, and there's plenty to see on a short out-and-back or loop hike with the kids. We think it's especially appealing during the winter, when there are plenty of birds to watch and it's lush and green. While Rush Creek Preserve can seem like its a world away from the commotion of the outside world, its main trailhead is only a few yards from Highway 101, off of Binford Road near the Atherton Avenue/San Marin Drive exit. It's a little incongruous to have freeway traffic zipping by as you begin your hike, but the proximity of 101 definitely makes it easy to get to. If you're willing to venture a little further afield, there are additional trailheads to the east off Bugeia Lane and in Novato's Bahia neighborhood at Bahia and Topaz Drives. An easy and appealing loop hike at Rush Creek starts at the Bugeia Lane trailhead (just before Valley Memorial Park and the Novato Horsemen's Arena). Walk down the fire road that runs between the cemetery and a neighborhood and you'll end up at Cemetery Marsh, a broad wetland teeming with ducks, egrets, hawks, and other birds. Cross the little bridges and head to your right on the fire road that skirt the marsh. When the trail starts to head up into the woods, bear left and cross the marsh, then take the fire road on the opposite side of the marsh back to the bridges and the trailhead. The whole hike is approximately 1.5 miles, and there are plenty of opportunities to stop and look at birds or relax and have a snack or picnic. Of course you can continue on the trails if a longer hike is in the cards. Another great hike for families is an out-and-back hike to Cemetery Marsh along the Pinheiro Fire Road. Start at the trailhead on Binford Road; it's a little over 2 miles round trip. With the oak forest on one side of the trail and Rush Creek Marsh on the other, there's plenty to see along the way. 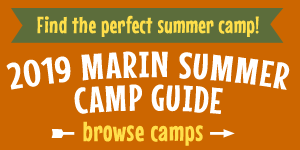 Visit the website of the Marin County Open Space District for more information on Rush Creek and to download a handy printable trail map of the preserve. The Open Space District's site also features a great online field guide where you can check out all the species of birds, mammals, reptiles, and amphibians that make the Rush Creek Preserve their home. No drinking water or restroom facilities are available at Rush Creek Open Space Preserve. The area can get pretty hot during the summer, so bring hats, sunscreen, and plenty of drinking water. On-leash dogs are allowed on fire roads and multi-use trails, as are bicycles and horses. To get to Rush Creek Open Space Preserve, take Highway 101 north to the Atherton Avenue/San Marin Drive exit in Novato (this is the last Novato exit). At the intersection, turn right onto Atherton Avenue, and then take an immediate left onto Binford Road after the park-and-ride lot. Follow Binford Road a short distance; the trailhead will be on your right. You can park along the road or in the park-and-ride lot. Alternatively, keep going on Atherton Avenue, then turn left onto Bugeia Lane; you can look for the small parking area at the Bugeia trailhead or continue down the road into the Bahia neighborhood, where the trailhead is at the bottom of the hill at the intersection of Bahia and Topaz Drives.